Not that I care much about the holiday, but I guess that the 8th day of Hanukkah is a good time to share tasting notes from the two bottles of He’Brew that the fluffy angels of Beer of The Month Club sled down our chimney wrathful prophets from Beer of The Month Club nearly smashed in our fridge. I’ve wanted to taste Schmaltz’ creations for a quite a few years now and even got my brother to get me a bottle from the Coney Island series from his visit to New York – a bottle that’s patiently waiting for a certain beergeek to find the time for tasting. Anyway, a couple of days ago The Secret Agent and I drank those BOTM bottles. A good beer label, one that tells a story, wins points in my book and Schmaltz’ colourful and informative labels did the job: tons of ingredient info and background. The Hop Manna IPA’s label teaches you Goyim the legend of Manna that sure reads like an hallucinogenic I’d try. Heathen hopheads can learn that the beer contains 6 different types of hops and is dry-hopped with Cascade and Centennial. The copper-amber beer typically smells of grapefruit and rock candy and tastes bittersweet accordingly. It is an extremely balanced IPA, softly carbonated and pleasant to drink. 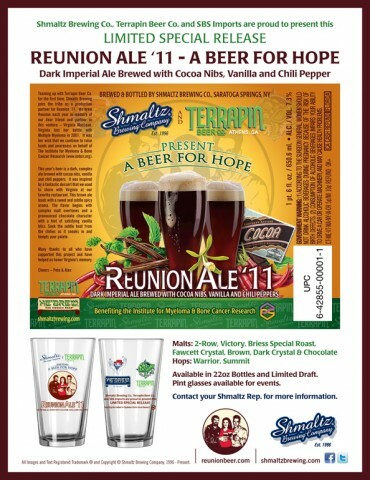 The second beer delivered in this batch was Reunion Ale – A Beer for Hope, a collaboration between Schmaltz and Terrapin Beer Company from Georgia. That’s a series that Terrapin brews once a year in memory of their friend and partner Virginia MacLean, who died of Multiple Myeloma in 2007. The Reunion Series is a fund and awareness raiser on behalf of The Institute for Myeloma & Bone Cancer Research. The American Strong Ale is predictably opaque black and pours a small head. I smelled bittersweet chocolate, some vanilla and roasted malt. The beer has a dominant chocolate taste with some sting in the end. I left my glass on the table and returned after 15 minutes to find vanilla taking over the aroma and the chili making appearance in the mouth – that was pretty cool. Finish is long and sweet and very chocolatey. It was a nice ending for a long and cold day but I am still on the lookout for the perfect chocolate beer.